Failure to progress is the number one reason first time mothers end up having an unplanned cesarean birth. Many times the cause of the cervix failing to open is related to the baby’s position and how is it rotating through the pelvis and applying pressure onto the cervix. While some misalignments may not be able to be corrected, learning how to create balance in the birthing person’s bony pelvis and soft muscle tissue can best support baby’s chance of finding an easier exit. 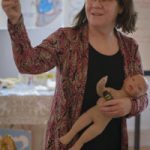 In today’s episode of Yoga | Birth | Babies, I have the pleasure of speaking with Gail Tully, certified professional midwife (CPM) and birth doula (DONA), and founder of www.SpinningBabies.com. 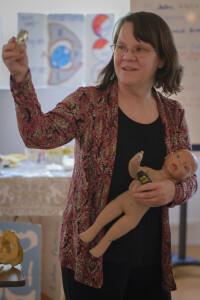 Gail and I discus the principals of Spinning Babies and the how the position of the baby and the balance in the birthing person’s body plays a vital role in the ease and functionality of birth. 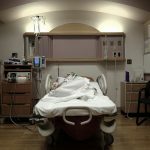 For expectant mothers, partners and birth workers, the podcast will offer take a tips to help prepare the body for birth. Why fetal position and balanced pelvic ligaments and muscles, the pelvic structure and psoas impact the baby’s position to greatly. The Spinning Baby’s 3 principles of pregnancy? Common habits women are doing in their everyday lives that can create imbalance in their pelvis, pelvic ligaments, psoas and pelvic floor. Is there an ideal position? 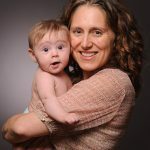 Gail Tully, is a certified professional midwife (CPM) and birth doula (DONA).